Chatbots (or bots) are hot. Retrieving data through natural language is getting more and more common. Many people already have apps like Slack or Messenger installed and letting them use your application through these channels can provide you with more opportunities. In this article I’ll show you how to build your first chat bot with Bot Framework and LUIS. Although LUIS is not required for the bot framework itself, we dive directly in the combination of both. Check out my previous article on how to set up LUIS. Building a bot with the Bot Framework is extremely easy, yet very powerful. Let’s see how this can be done! I’ll be using Visual Studio as my IDE. Bot Framework Visual Studio Template: This allows you to create a Bot Framework project easily. 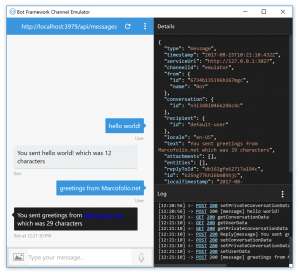 Microsoft Bot Framework Emulator: Needed to emulate talking to your bot. A LUIS model. I’ll be using my RestaurantLuisModel from my previous article. Don’t forget to publish this app in LUIS. 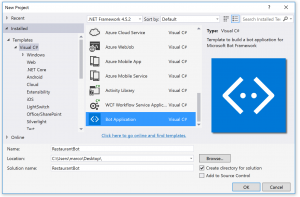 Download the Bot Framework Visual Studio Template and install it as a ProjectTemplates. Once installed correctly, create a new project in Visual Studio. Select Bot Application and give it a name. Create your solution and you’re ready to build your first bot. 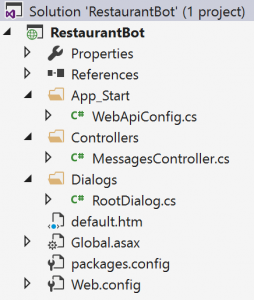 WebApiConfig: Since the Bot Framework runs on ASP.NET WebAPI, this class is needed to handle settings, config and routes. HandleSystemMessage(Activity message): System messages can be handled as well, for example you can get notified when the user is typing a message. new Dialogs.RootDialog(): When a user message is received, the RootDialog is created. RootDialog: The starting point of our bot. Inspect the MessageReceivedAsync-method where you’ll see that the bot will respond to any message by telling you how many characters you’ve sent. Without doing anything furter, we’re able to talk to this bot. Simply build and run the application which will start your browser with a general message from the default.htm-file. To be able to talk to this bot, we’ll first be using the emulator. 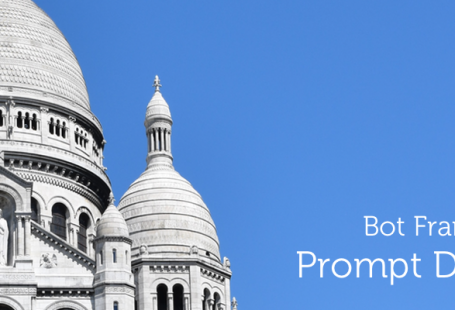 Simply start this application and enter your endpoint URL. Since the application is running locally, enter the URL from the browser window that just opened and append /api/messages (this is the default route). Hit Enter and the Emulator will start connecting with the bot. Simply type a message and start chatting with your first bot! The URL on top where you’re able to see to which bot you’re connected to. The messages window on the left side to show you the conversation. 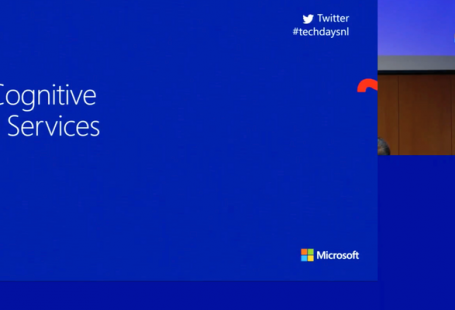 If you click on a message, you’ll get more (technical) details in the Details-pane. The Log-pane displays the current activity and communication. 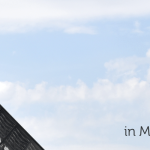 A LuisModel attribute has been added, requiring a LUIS_MODEL_ID and LUIS_SUBSCRIPTION_KEY from LUIS. LUIS_MODEL_ID can be found on the Overview for your app, also called an App Id. LUIS_SUBSCRIPTION_KEY can be found under My Keys. The dialog now inherits from LuisDialog. 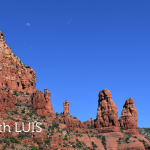 The LuisIntent attributes are used to handle the Intents that LUIS recognized. They should have the same name as configured in LUIS. That’s all there is to it! Simply build and run, fire up your emulator again and start talking to your bot to see if LUIS is able to recognize the intents. But LUIS isn’t only able to recognize Intents, but also Entities which makes everything a whole lot more powerful. In LUIS we’ve defined food as an Intent, so let’s try to extract that in the OrderFood-method. // Check if LUIS has identified the entity that we should look for. As you can see, we’re using TryFindEntity to search for the LUIS Entity we’re looking for. When we have that value, we display it to the user. It’s that easy! 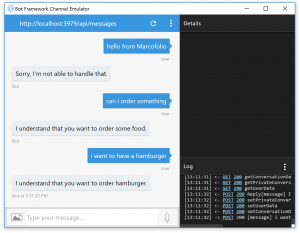 Now build and run again and see your first chat bot with LUIS come to life in your emulator. With just a few lines of code we’re able to make to make our first smart bot using the Bot Framework and LUIS. As you can imagine, we’ll need more to actually make this a useful bot but this is a pretty good start. Simply start adding more Intents to LUIS and let the Bot Framework handle these. 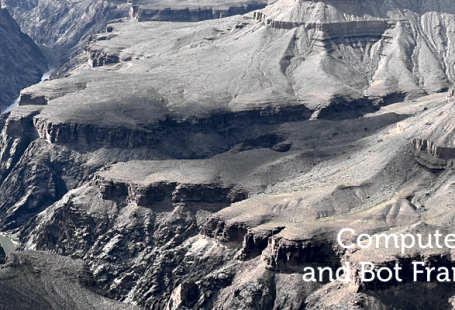 Stay tuned for more articles about smart bots and the Bot Framework. Let me know what you think in the comments or on Twitter.